Then there’s gold medal fast. St. Edward senior Shavontae Samuels culminated his outstanding Beaver athletic career this past weekend by blazing to a pair of gold medals in the Nebraska State Track & Field Championships at Omaha Burke Stadium. 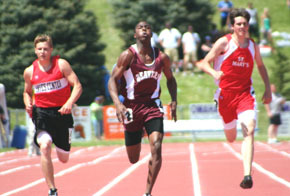 On a pair of gorgeous spring days, Samuels capped a dominant 2008 season with victories in the Class D 100 and 200 meter dashes. Samuels also placed third in the D 400 meter dash. In all, 26 athletes from Albion News area schools competed in the state meet, earning 11 top-eight finishes. Competitors established five 2008 News area best marks during the meet. In state meet team scoring, Samuels racked up 26 points to place St. Edward fifth in the final Class D boys standings. Lindsay Holy Family tallied 18 points and tied for 12th. In girls scoring, Cedar Rapids finished with eight points (28th) and Holy Family six (34th). 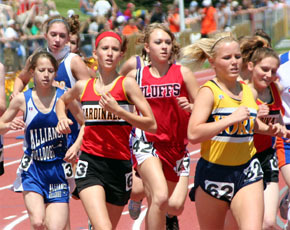 Boone Central was represented in Omaha by three athletes in the girls competition. Junior Halie Smith continued her season-long improvement by besting her News area best time in the 3200 meter run by nearly a second and finished 15th in the Class B field in 12:31.4. Senior Ashlynn Bader concluded her illustrious Cardinal running career three places back of Smith with a time of 12:43.2. 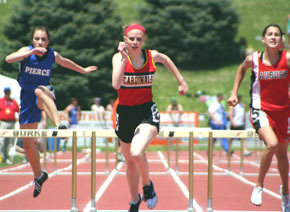 Sophomore Megan Bygland competed in both Class B girls hurdle events at Burke. She ran a strong 48.865 in the 300 meter lows – just 2/10ths off her season best – and placed third in her preliminary heat, just missing the event finals. Bygland had an off day in the 100 meter highs, finishing seventh in her heat in 17.04 – well off her News area 2008 best of 16.1. Without a doubt, the area’s most impressive state meet performer in 2008 was Samuels. 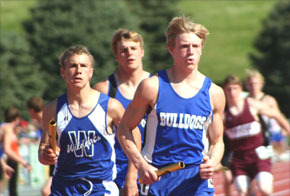 The Beaver senior didn’t match his season and News area best marks in his specialties – the 100 and 200 dashes – but had little trouble garnering his first state track championship gold medals. Samuels opened competition in the 100 meter dash Friday by cruising to first in the third prelim with a clocking of 11.425. Saturday, he raced to the D 100 title with a winning time of 11.256, well in front of Hayes Center’s Brian Christner (11.34). The speedy senior was also dominant in the 200 dash, easily winning his prelim Friday in 23.121 and pulling away from runner-up Logan Shermer of Loup County (22.828) to win Saturday’s final in 22.624. Samuels did post a personal and News area best in the event he didn’t win at Burke. His 400 dash heat runner-up time of 50.165 was his best of the season and he followed that with a 50.697 in Saturday’s final, placing third behind Matthew Shipp of Bertrand (50.145) and Samuel Matson of Hitchcock County (50.495). 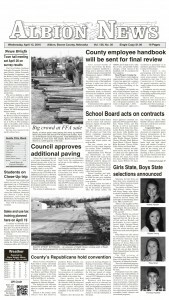 Complete Area State Track Details in Print Edition of Albion News.